Shri H. V. Seshadri has beautifully brought out his ideas of Social Imperativeness of Yoga - through the paths of Karma, Jnana. 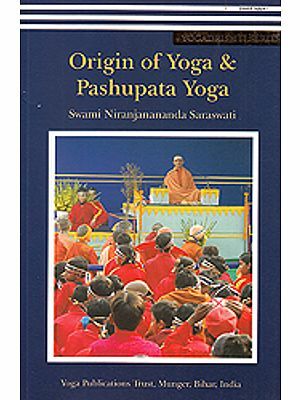 Bhakti, and Raja Yoga. The aspect of how the Dosha Bija or the defects of emotional turmoils in man are eliminated and his inborn potentiality of values and virtues are enhanced and sublimated in Divinity through Yoga is also dealt with clarity. The world is now coming closer and closer - pointing to our ancient concept of Vasudhaiva Kutumbakam - which means a world where all living beings live in harmony and contentment. But the present 'coming together' is only at the physical level. Unrestrained self-centred urge to amass wealth has resulted in unhealthy cut-throat competition. As a result those endowed with dynamism and cleverness and also those who live a simple innocent life, both are caught in the coils of sorrow, despair and malice. Shri Seshadri has first explained how the individual should build up his physical, mental and intellectual health through the path of Karma. Jnana and Bhakti; which means, the limbs are to be directed towards good Karma, the head towards right knowledge and heart towards Devine Love. In order to have a healthy body, mind and intellect, the Yoga of Patanjali integrates man so as to cultivate a healthy body, a clear and clean intelligence for high thinking and benevolent heart which manifests love without lust. Patanjali guides man to move from this well cultivated individual health, towards building up social health, through "Maitri karuna. mudita upekshanam, sukha dhukha punyapunaya vishayanam, bhavanaat citta prasadanam" i.e. cultivation of friendliness towards the good and the holy, compassion to those in distress, and indifference towards the evil-minded (only) after trying all means to improve them but who do not change their nature) and evenness in pleasure and pain, virtue and vice, result in the tranquility of the mind. For this to happen, as Shri Seshadri puts it with delicate warmth. Dharma (duty), Artha (means of livelihood), Kama (enjoyment), and Moksha (emancipation) are placed in such a way that the mental turbulance that sparks from Artha and Kama are subdued by placing them between Dharma and Moksha; or, in Shri Krishna's words. it means regulating diet recreation, action. sleep and wakefulness for a healthy and happy living. 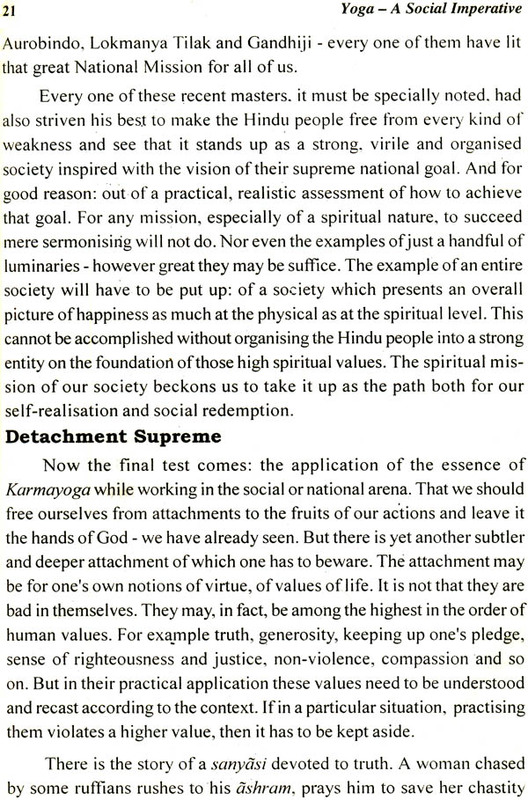 Shri Seshadri has explained all this in detail and I am glad to share his thoughts. May the thoughts in his work 'Yoga - A Social Imperative' gain momentum in the hearts of one and all. We are happy to present this small publication before our discerning readership. 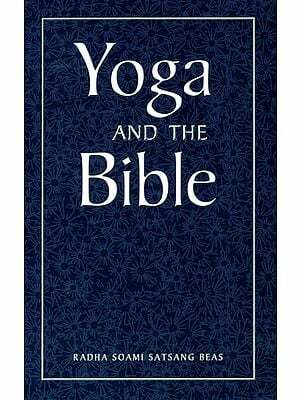 For, as the title of the book bears out, its theme touches upon the vital relevance and importance of the role of yoga in the social field, - a subject of deep concern to the modern generation and. especially to its intelligent and enterprising sections. The articles herein included seek to throw light on the Yogic attitude to be adopted vis-a-vis quite a few aspects of our daily life which cause mental conflicts in our human relationships at all levels, including our homes, and non-adjustments with the situations all around. These, as we very well know, result in mental tensions and endless worries which give rise to psychosomatic ailments also. The articles may be of some help to know how the Yogic attitude will be of use in overcoming them. 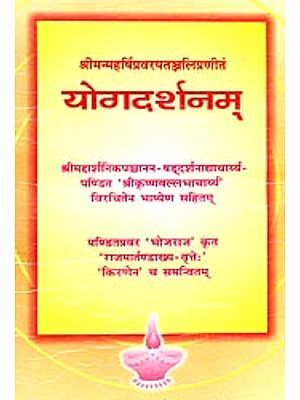 We also hope, that this book will be of special interest and guidance to selfless workers engaged in the difficult task of building a spiritually oriented, well-organised social life. Since the problems and challenges posed to the human mind are common to all individuals and societies - and more severely to those oriented towards the Western life styles - the present book may well be of universal appeal also.